yCal is designed to give you the best possible overview on a full year. As such, it offers a month-by-column year view (accessible by pressing either 1 or the button in the horizontal divider bar). The horizontal divider bar can be dragged up and down with the button to switch to the week view (alternatively, press 2) or show boths views side-by-side if the window height permits. Select a day in the year view and press your keyboard's space bar to open a quickview panel for that day (alternatively, double-click the day). With yCal, you can mark days in the year view as if you had virtual felt markers. To use markers, you'll have to do two things: first, define a calendar that will be used to store your markings (it's actually good practice to set up a new calendar specifically for that purpose). 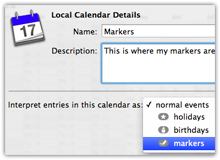 Right-click on the calendar you want to use, choose "Edit" and set "interpret calendar entries as" to "markers". You'll see a little gray marker sign right to the calendar's name. Second, define your markers with their style and color: press in the lower left corner and choose "New Marker". Give your new marker a name, display style, and set the calendar to be used for storage (the one you defined in the step above). Now you're good to go and mark days in the year view: select a couple of days, right-click and choose "Mark selected as". If you switched on both the marker calendar and the marker in the left column, you'll see your days marked as desired. You can tell yCal to interpret events in a specific calendar as public holidays which will be displayed similar to weekends in both the year view and the week view. 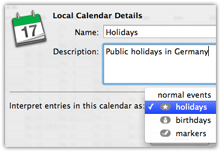 To do so, right-click on the calendar with your holiday data, select "Edit" and set "interpret calendar entries as" to "holidays". You'll see a little gray sign with a star right to the calendar's name. Now when you double-click on such a holiday calendar, you get a special edit panel where you can easily set your holidays for the year. Similar to handling holiday information, yCal can also handle birthdays in a dedicated fassion. Again, choose the calendar that holds birthdays, right-click on the calendar, select "Edit" and set "interpret calendar entries as" to "birthdays". You'll see a little gray sign with a candle right to the calendar's name. Now when you double-click on such a birthday calendar, you get a special edit panel where you can easily see and edit all birthdays. 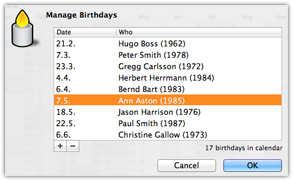 You can configure the year view to show all birthdays to get a quick overview. To this end, make sure the birthday calendar is switched on, then right-click in the year view and select "Show birthdays". With yCal, you can easily write some notes on a day without creating a full-fledged event. As a prerequisite, you have to have at least one calendar set up for marker storage (see "Calendars and Markers" above). Given that, and having selected a day in the year view, you'll create a note by just starting to type something on the keyboard (no need for an additional menu click or pressing a shortcut!). Configure the year view to "Show notes hints" (right-click in year view), and days with notes attached will be shown with a little triangle in the upper right. This is just a short list of the most essential aspects. But yCal has so much more to offer! Go explore and see how yCal will help you regain control over your time! Additional hints may also be found in the FAQ section. Copyright © 2017 by WhizBits. All rights reserved.